The commissioner Armao: "The province of Trapani is strongly linked to the history of Sicily. "The superintendent Tusa: "No chance, These findings are a result of a constant "
A cargo ship of the '500 was found in the waters of the Gulf of Castellammare. Evidently the winter storms have removed large quantities of sand bringing out the remains of the ship likely. Reported by freelancer, Vito Slim, a survey was carried out promptly headed by Gaetano Lino Superintendent of the Sea, assisted by Franco Balistreri. It was a long time that the Superintendent of the Sea was on the trail of this vessel reported by locals. But any attempt to locate it had been in vain, for the non-identification of the exact place of arrangement or for the presence of strong silting. All the signals converge in affirming the presence of a wrecked ship from the sandy coast between Castellammare del Golfo and the mouth of St. Bartholomew, facing the town now called "Plaja". There was also a document dated to the end of 1400 that conspired to enliven the research. This is an archival document that mentions a vessel that, after loading grain at the Valley of the magazine site east of town Magazinazzi, had moved to the shipper of Castellammare and had loaded another batch of wheat. For the occurrence of adverse weather conditions the ship failed to take off and sank. The document is not precise enough or the circumstances of the sinking of the boat or on the characteristics (name, owner etc. :), however, raises questions, Perhaps the discovery today that might partially answer. What emerges is a sequence of four segments of vessel placed on an axis parallel to the coast for a total length of 22 meters which should be approximately the total length of the vessel. The width is not determined because the ship is shattered on impact with the sand during the sinking and the elapsed time did the rest deteriorating substantial portions of the hull. You notice ordered, floor timbers and planking assembled portions emerging from the sand. The bow is at the eastern end of the hull. 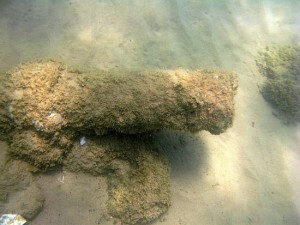 At the other end, towards the stern, a small cannon was located partially outcropping from the sandy bottom of the length of just over one meter, with the mouth diameter of about 15 cm outer 7 internal. The presence of firearms in the merchant ships should not be surprising since they were always armed against possible attacks by pirates. At about half the length of, of fore and aft, you can see the metal bars protruding from the sand, that could be identified as rigging rails. It is interesting to note that the shell and, then, the hull, was coated on the outside by a metal sheet is likely bronze. 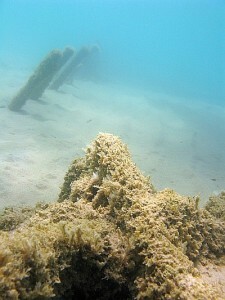 From the arrangement of the various parts of the wreck can be seen emerging from the sand that the ship lay back on the right flank pushed by the waves at about 2,20 meters deep and 70/80 meters from the beach. Load we do not see anything. The rest, if it was actually wheat, it was completely lost, while a large mass of ferrous material unidentifiable spread in the wreck and its immediate vicinity. Between this will likely notice some circles of barrels, belonging to the containers of water for the crew, and tubes that could be parts of guns. There is also fragmentary pottery including fragments of jars glazed in dark green with distinct neck crossed by grooves of a type in use since the fifteenth century. At the time, the technicians of the Superintendent of the Sea, coordinated by the Superintendent Sebastiano Tusa, have operated only for documentation and location of the wreck in order to prepare immediately for the protection devices is not subjected to damage or looting. They also made the first inferences emphasizing the importance of the wreck in the history of maritime trade in Sicily dating the wreck probably the XV - XVII. It will take another dive, and other observations to assess the precise dating of the ship and, eventually, solve the riddle of the probable identification with the merchant ship mentioned in the document sixteenth. The Regional Councillor for Cultural Heritage, Environmental and Public Education, Gaetano Armao underlining once again the richness of our seas from the cultural point of view has highlighted that "this further page of history helps Sicilian marinara to connote the more Castellammarese the district as a place strongly tied to moments in the history of the island, island during which the company was able to draw resources from the sea, as evidenced by the many traps in the area, Magazinazzi from the pedal in Scopello, but he could use the sea as a vehicle for profitable businesses related to agricultural production. We reaffirm our commitment to increase the search operation and protection of assets that lie within territorial waters ". The superintendent of the Sea, Sebastiano Tusa: "The discoveries made in this fruitful season are not the result of chance but of a presence in the tissue structure of the marine isolate, and a 'systematically searching, based on a profound knowledge and extensive experience gained over time. The discoveries are made because the search is constant and, above all, because the Superintendent of the Sea is now established between the people who now sees in it not just another entity vexatious, but rather a gathering of professionals in the service of the community and, then, of reliable people that deliver the secrets of her memory ".